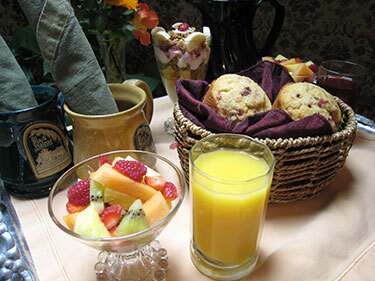 Breakfast at The Black Walnut Bed and Breakfast is carefully and freshly prepared each morning. Home baked muffins or scones as well as a serving of fresh cut fruit is the base of your breakfast. You then choose from a menu; selections include coffee, tea, hot chocolate, an assortment of juices, hot and cold cereal, our famous home baked Door County granola, yogurt or a parfait (granola, fresh fruit, vanilla yogurt), to add to your tray. Breakfast is then served to your door with a light knock and a soft 'good morning' at the time of your choice between 7:30 and 10:00 am. Organic and or local ingredients are used whenever possible. If you have special dietary needs we are willing to do our best to accommodate; we are proficient at preparing Gluten Free fare as well as egg free and dairy free at no extra charge. Please let us know in advance.